The following New Forest common rights are now largely obsolete. 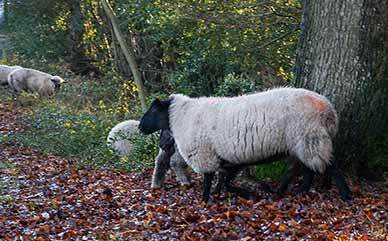 Common of Pasture for Sheep allows sheep to be put out to graze on the New Forest. It is attached to former monastic property in the south-east of the New Forest, and to a few fields in the extreme north-west. Common of Pasture for Sheep is now rarely exercised. Common of Marl allowed the extraction of lime-rich clay for use as a fertiliser. It is now no longer exercised. Evidence of Common of Marl can, though, still be seen in numerous disused Marl Pits dotted about the New Forest. Richardson, King and Driver, for example, on their late-18th century map of the New Forest show near Beaulieu 'Old Marl Pits' where today is Hatchet Pond - it's been suggested that the pits eventually flooded to form Hatchet Pond. Common of Turbary allowed peat turves to be cut for fuel, but only for personal use. Each piece was about 46 centimetres x 23 centimetres (18 inches x 9 inches), but so as to not exhaust supplies, for every one cut, two would be left each year. Peat Moor, near Lyndhurst, is shown on the late-18th century Richardson, King and Driver map, and reminds of Common of Turbary, which, before the widespread availability of reasonably priced coal in the early 20th century, was of considerable value. Common of Turbary is now, though, no longer exercised.